Earn £1 worth of loyalty points when you buy this item. Shirt: Twin button cuff fastening. Box pleat. Left breast pocket. Button down collar. Machine washable. I am very pleased with the fit and quality of the shirts. Both classic and tailored fits are available in Brook Taverner shirts. The classic fit is roomier around the chest while the taolired fit is a more streamlined version. This more tailored option is inspired by European style, which offers a closer fit around the chest. Our Brook Taverner shirts are meticulously designed to provide the perfect form under our suit jackets, sweaters and waistcoats. 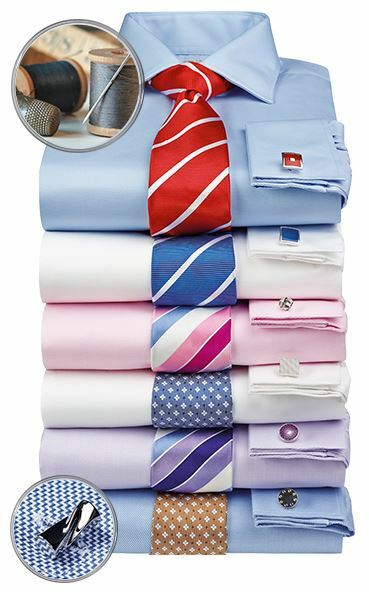 Tailored with the best fabric -2 folds 80s cotton for extra strength, body and ease of care, a split yoke back and removable collar stiffeners, —marks of a quality garment. Manufactured with thorough attention to detail for maximum comfort, fit and performance. Our formal shirts feature double cuff with cufflink facility, removable metal branded collar bones, split yoke with twin pleat back. Characteristics of our casual shirts include twin button cuff fastening, button down collar, twin pleat back and left breast pocket. Available in both classic and slim fit. 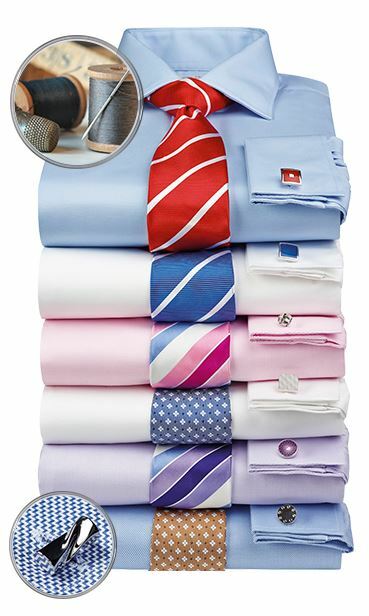 Pure, breathable cotton is the best choice for any dress shirt. Our 2 folds 80s cotton provides extra strength for years of wear, the ideal weight, and easy care. Both classic and tailored fits are available in Brook Taverner shirts. The classic fit is roomier around the chest while the tailored fit is a more streamlined version. This more tailored option is inspired by European style, which offers a closer fit around the chest. Our Brook Taverner shirts are meticulously designed to provide the perfect form under our suit jackets. 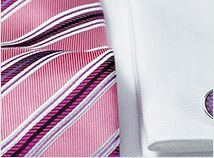 A well-fitted classic fit shirt will elevate the suit and tie worn with it, making you feel your confident best. Understanding how to get the right fit for your body type and sense of style will serve a man well whether he is on his way to the office or an evening on the town. A well-fitted shirt collar should allow for one finger between the neck and the collar. Shoulder seams should meet directly at the corner of your shoulder bone. 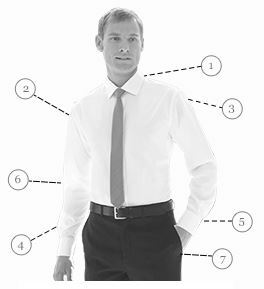 For the perfect fit, the sleeve of your shirt should fall where your wrist meets your hand when arms are resting at your side. To achieve this, be sure the sleeve itself is long enough to reach beyond the wrist while the cuff circumference is tight enough to prevent the sleeve from slipping to the back of the hand. The midsection of your shirt is one of the most important areas. When it fits properly you’ll still look polished, even when your suit jacket is removed. For the classic fit, the torso is more roomy, but should never be sloppy. If you can pull more than 4 inches of fabric away from your body, the shirt is too big. 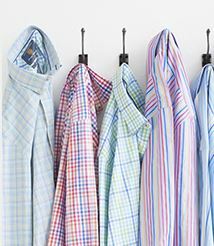 7Classic fit shirts may vary in length but should be long enough to tuck in without pulling out of waistband when arms are raised chest high.